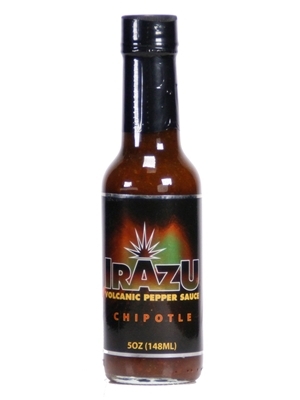 Irazu Volcanic Pepper Chipotle Crushed Pepper Sauce is a powerful, smoky sauce with real substance. As with most of the Irazu line, this is a crushed pepper sauce- not a soupy hot sauce that is loaded with vinegar. Instead, it is loaded with chipotle peppers, crushed habanero peppers, onion, lemon juice, garlic pulp, and passion fruit juice. The result is a sauce that will find its way onto everything you eat, from eggs to pizza. 5oz.